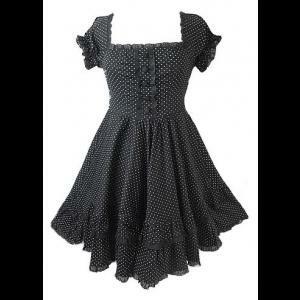 A very pretty dress from Hell Bunny made from black and white polka dot cotton with some stretch. 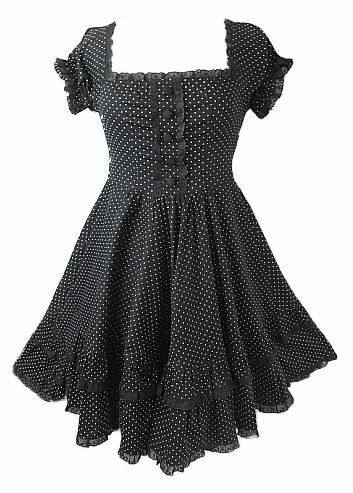 The dress has a flattering square neckline edged with black broderie anglais trim and the centre front has black fabric covered button decoration with broderie anglais trim either side. 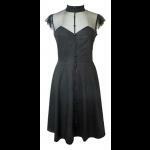 The back has two crossover straps with a 3 button positioning and an elasticated panel to ensure a perfect fit. This panel has a concealed zip fastening and two ribbon bows decorate the lower skirt at the back. 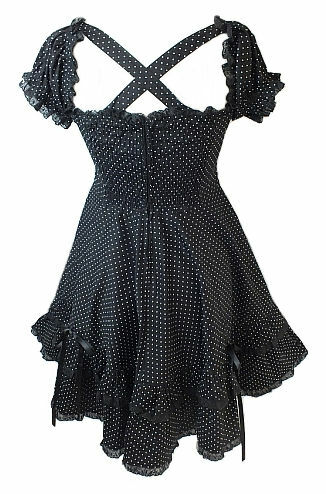 The short puffed sleeves have elasticated cuffs trimmed with black broderie anglais and the hem of the dress is also edged with brodierie anglais with a trimmed frill above. 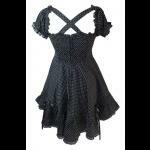 Can be worn with a petticoat for a fuller effect. Bust: 30" Waist: 28" Length: 36"
Bust: 32" Waist: 30" Length: 36"
Bust: 34" Waist: 32" Length: 36"
Bust: 36" Waist: 34" Length: 36"
Bust: 38" Waist: 36" Length: 37"